What a tough one it was for the Orange back on Tuesday night. Syracuse lost to Florida State 80-62, in what simply was the latest poor showing from a team barred by inconsistency. However, the Orange has a nice chance to bounce back on Saturday against its next opponent. 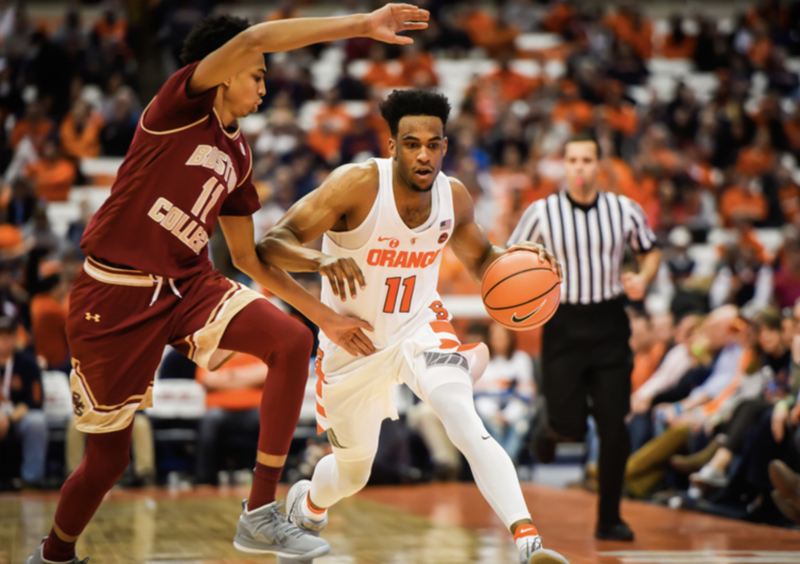 Boston College enters having dropped eight of its last ten, including three straight – a streak that started with a home loss to Syracuse back in Chestnut Hill. It’s no secret that Ky Bowman is the focal point of BC’s offensive game. The junior averages a tick over 20 points per contest, including a 21-point outing in a losing effort against the Orange back on Jan. 30. He also leads the Eagles in assists per game (3.7), and is tied for most rebounds (7.8), an impressive feat for the 6’1” guard. Bowman made half his threes (3 of 6) in the two teams’ first meeting of the year. That’s something Syracuse will want to be cautious of this time around, considering the North Carolina native attempts the fourth-most threes per game in the ACC (6.6). Opposite of Bowman, Syracuse’s main man looks to build on his last performance against BC. Junior Tyus Battle had 31 points, 4 rebounds and 6 assists in SU’s 77-71 road victory. However, Orange fans might see someone else to shine on Saturday… someone who didn’t get it in on the fun quite like Battle did just nine days ago. Coming in with at least 16 points in three of his last four, I’m banking on Oshae Brissett to make some noise against the Eagles. In those last four, Brissett has been taking less threes, and its led to more efficient outings. Entering SU’s Jan. 26 matchup at Virginia Tech, the sophomore was shooting 37.8 percent from the field on the year. However, over his last four, the Ontario native has shot 55 percent, a considerable improvement. In fact, the only game he didn’t reach 16 points in that span was at BC, where Brissett tallied just nine points, albeit on a relatively efficient 4 of 7 shooting. All in all, being at home against a stumbling 11-10 Boston College team should bode well for the Orange. Furthermore, unlike in its matchup against Florida State, Syracuse has the luxury of staying home for its meeting with the Eagles. Against FSU on Tuesday, the Orange was playing on a quick two days off, which included a trip home from Pittsburgh. So, with a bit more rest, no trip back to The Hill, and a seemingly easier test ahead, a loss to its struggling conference foe would be mightily disappointing for SU. While the line for this one remains undetermined for the time being, ESPN’s College Basketball Power Index gives Syracuse an 87.7 percent chance to emerge victorious. Tipoff from The Dome is at 2:00.